Qualcomm Atheros AR5008X Wireless Network Adapter is a Network Adapters device. The developer of this driver was Qualcomm Atheros Communications Inc.. The hardware id of this driver is PCI/VEN_168C&DEV_0024&SUBSYS_7132144F. 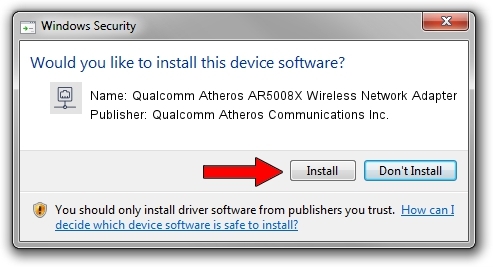 Download the setup file for Qualcomm Atheros Communications Inc. Qualcomm Atheros AR5008X Wireless Network Adapter driver from the link below. This is the download link for the driver version 10.0.0.227 dated 2013-02-20. This driver received an average rating of 3 stars out of 22278 votes. The most important advantage of using DriverMax is that it will install the driver for you in the easiest possible way and it will keep each driver up to date. How can you install a driver with DriverMax? Let's follow a few steps!